Finding a blood bank is sometimes an emergency. As I am a Doctor I have seen many child was saved because of transfusing blood at the right moment. Delay in blood transfusion can cause death. Some situations require urgent blood transfusion. Every major hospitals has its own blood transfusion department. They store blood and fulfill the demand when necessary. But sometimes they don’t have the right group of blood in their store. That’s when a blood bank comes in action. There are many reputed blood bank in Dhaka as well as fraud blood bank. There are many disease including Hepatitis B, C, HIV can transmit through blood transfusion. That’s why it’s mandatory to screen every blood bag before transfusion. I have seen some patients acquiring Hepatitis C after history of blood transfusion. Although it’s not proved that blood transfusion was responsible for Hepatitis C in that particular case but it’s a strong suspicion. Some children get regular blood transfusion. They are at risk of getting blood borne infection. Blood bank is a place where supplies of blood or plasma for transfusion are stored safely for donation. Cord blood banking is a new idea where blood is collected from in your newborn’s umbilical cord and placenta and storing it for future medical use. Cord blood contains potentially lifesaving cells called stem cells. The stem cells in cord blood are different from embryonic stem cells. Although this facility is not readily available in Bangladesh. And it costs a lot. Sometimes only a small amount of blood is needed for transfusion. Mostly in neonatal ward and NICU. Here blood is directly transfused from donor to receiver after cross matching and screening. Small-volume blood transfusion from mobile donors such as parents and relatives, doctors and social worker available readily is found to be safe, effective, time saving, lifesaving, and economic. It is undesirable that blood-from professional donors are used having the risk or low hemoglobin and transmissible diseases. Infants require only small amount of blood. Therefore the traditional collection of blood from a donor (amounting to about 400 ml) for transfusing to small children is a wastage. Moreover, obtaining blood from blood transfusion service requires more time, and often fresh blood is not available. Other advantages are donors are available at hand. Blood is not wasted, and the same donor may be used frequently. Blood from the healthy donor is drawn at bed side. Not all the blood bank are trusted and authenticated. Blood transfusion is a kind of business in Bangladesh. Some fraud people collect blood from drug abuser and sell them in high price. Those blood are not screened and it contains the disease. That’s why selling of blood is a punishable crime. Peoples are discouraged to collect blood from them. 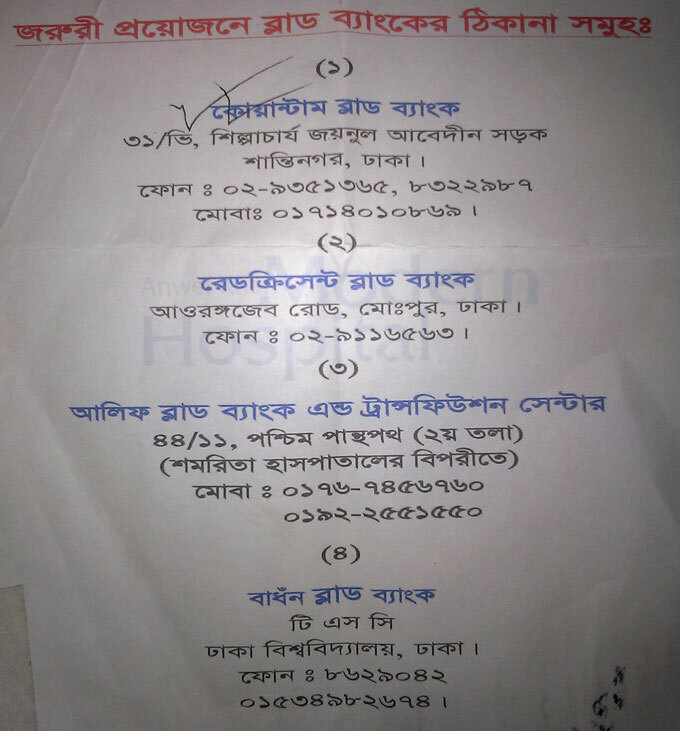 Here are some authenticated blood bank list with address and mobile numbers. 7/5, Aurangzeb Road, Mohammadpur, Dhaka. For those Thalassemia patients, it’s helpful. As the thalassemia patient requires regular transfusion. Address : Dhaka Medical College Unit, Dhaka. Central Police Hospital, Rajarbag, Dhaka. Well, these are good organizations for Blood transfusions. below some are listed, contact in case of emergency. The purpose of giving mobile no is to contact them if the required blood group is available or not. It is an excellent blood donation club. Here all the members are listed according to the blood group with mobile numbers. So you can easily contact them. I have registered there. There are many android apps for blood donor of Bangladesh. Among them, Blood Donation is a popular one. It will help you find blood donors from your area or your known institute. The process is very simple. As blood donation is a heroic work, we are trying to make a common platform for all blood donors. Contact donor through the phone call or via Facebook. Positive Bangladesh Blood Donors seems to be the largest group of Bangladeshi blood donors. Although I have doubt how many of them are active. They have a total of 178,145 members. And there is a Group Desperately Seeking – Dhaka, You can ask here for help. If you are lucky you may find a donor. That’s all for Now. Hope it helps. Share with your Facebook friends and save the link for the emergency. I want to donate my o+ positive blood for money. Please count https://bloodhive.org also one of the largest online blood bank working world wide and specially in Bangladesh.